This brief questionnaire returns a QI Model Score measuring the extent to which your clinical peer review program conforms to evidence-based best practices. 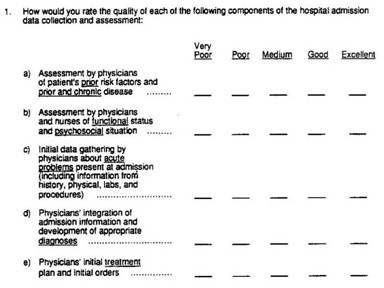 Answer the following questions as they apply to the entire peer review program at your hospital, not just within a single department. Your score will display after you submit your responses. If you wish to receive a copy of the results and analysis, please be sure to enter your correct email address. All information entered will be kept confidential. We do not sell or share our contact lists. This assessment, limited to an overall score, classifies the review decision, but does not measure clinical performance. 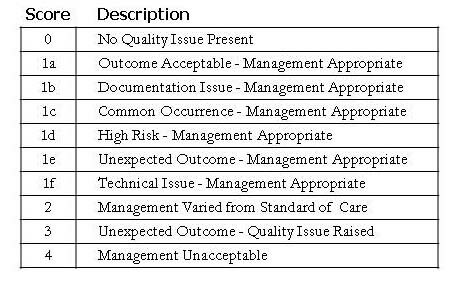 It has 10 options, but only captures 3 levels of management quality (Appropriate - Varied from Standard - Unacceptable). Multiple elements of clinical performance are rated on a 5 point scale from Best to Worst. Page one of several. cf: Rubin HR et al. Guidelines for Structured Implicit Review of Diverse Medical and Surgical Conditions. RAND; 1989 N-30066-HCFA. Which statement best describes the level of participation by Reviewers in the Peer Review process? In each case review, we do little more than ask, "Was the standard of care met?" Peer review activity may serve many aims, some of which are achieved by primary intent and others as means to those ends or as indirect benefits. To what extent does the primary aim and purpose of your peer review program target improved quality and safety of care? Medical staff members frequently report adverse events, near misses and/or hazardous conditions affecting their own patients for peer review. What proportion of case reviews are presented and discussed by a group or committee prior to final decision-making? Which statement best describes the relationship between peer review and credentialing at your hospital? Thinking of case review in general, (not a Morbidity & Mortality Case Conference or a Serious Occurrence investigation), how likely is it that one or more clinicians involved in that patient’s care will be solicited for input to the review process? Hospital leaders commonly follow a "dashboard" of key performance measures relevant to their area of responsibility. Here, we are interested in learning only about those that are tracked specifically to monitor or improve peer review program performance, whether or not such measures are used for other purposes. What process or outcome measures of peer review activity are tracked and reviewed either by individual committees/departments/service lines, the governance committee or the Board?